I hate going to my childhood home. My father keeps everything. He's got my school report cards from when I was in 4th grade. I probably flunked a few subjects and I hate being reminded of how stupid I was... but he still has all that. It wasn't until I moved out of my dad's house that I realized the secret to make my life simpler. This secret alone helped me find a new energy in my self, accomplish the things that I wanted to accomplish and do the things that I wanted to do in my life. Look around you wherever you're sitting. Look at all the things that are around you. Chances are that there will be a lot of things there that you see there... especially if you've been living in the same house for a long time. ... an old PC that I wanted to convert into a media server. Then Apple came out with the Apple TV, that computer is sitting in a corner of the house. My elder brother's old Atari and Sega Mega Drives - yeah remember those. He wants to keep them god knows why. I noticed that there was a lot of stuff that was great in the house, but a lot more that reminded me of bad times. I remember all these things because of the stuff that was lying around there in my dad's house. I looked at that stuff and old memories would come hurtling back at me. I couldn't help it. It's like muscle memory, when I climb the stairs of my childhood home, I run up the stairs like I always did as a child, never even feeling the burn. I skip a step. I don't even notice it. This I realized is what is called muscle memory. You're muscles remember the things that you're good at doing and then when you do them next time - it's easier to do them. This is specially true for things that you do everyday. Notice how you hold your cup - you could hold it like that probably for the whole day without noticing it. That's because of muscle memory build into your hand. This muscle memory is more true for 'emotional' things. What that means is things that have an emotional effect on you get buried in your 'emotional memory' more than any thing that you would actually remember by 'learning' it. And the worst part is that emotional muscle memory doesn't just get triggered when you think about those things - but even happens when you see something related to an emotional memory. What this means is that when you see the things that originally triggered the emotion - you will feel the same emotions again, the same trauma, the same torment that the original event caused you. It is estimated that we think about 35 - 50 thoughts every minute. Or about 2,000 thoughts at the low end. Think of each thought as being a small sentence. Something that has maybe 5 words. Like this sentence is short. Add to that the fact that about 90% of thoughts that you think in a day is negative thoughts. Thoughts related to past hurts, past breakups, something someone said or did. So we spend about 1800 thoughts every hour thinking about bad stuff that has gone on in your life. You're thinking about everything in the past. Every thing that went wrong. Now lets think about the 1800 negative thoughts and think about each thought having just 5 words in each thought. That's about 9,000 negative words every hour that you're saying to yourself. Now let's bump this up a little more - you're awake for 15 hours (with roughly 9 hours of sleep). That translates to 135,000 words every day. Or a 540 page book everyday. What this means is that anything that happened to you a last week is making you carry around 7 full length novels. Try carrying that around in your backpack. Now think about your life in total. From your conscious life to date. If you're 20 years old, and you remember things in your life from when you were 10 years old - that 7 years of thick books. That's a WHOPPING 3,650 books that you carry around with you all the time. If you're any older than that you're probably carrying twice or 3 times that amount of 'junk' in your head in your life. No wonder your back hurts... your head feels full and it's hard to make quick decisions. But that's not all - think about the actual stuff that is lying around in your house. You're also carrying that around with you in your life. Here's the secret to making your life simpler... not just in your life physically, but in your mind, logically, and in your heart emotionally. Goto your room and give away 50% of everything that you own. Be ruthless... this will help you clear physical space in your house. When you have physical around you - then you can think better and make better emotional decisions. You can sell your stuff on eBay if you like. If you feel uncomfortable just throwing it out - but trust me that this is the best thing to do - just throw it out, or give it to Goodwill. The purpose is to get rid of 50% of whatever you have lying around. This includes giving away your clothes, shoes, CDs, furniture. Give away 50% of everything you own. I know right now you're thinking that this is probably not the best advice you've gotten - but it will completely liberate you. It will actually be REALLY, REALLY, TERRIBLY scary when you think about it and it will cause your brain to go bat sh*t crazy when you are about it to do this. For most of us who can read this on the internet - we have too much stuff. Our closets are running over, there is too much furniture lying around, our drawers don't close, the pantry doesn't have any more space and our living room is bulging over with extra furniture. By giving away 50% of your stuff you not only create physical space in your life, but also clear up a ton of mental garbage. Clearing this excess baggage is going to give you the mental bandwidth to deal with everything else. Now that you don't have the physical baggage, you don't have to think about that ugly sweater your aunt gave you every time you open your closet. And how you hate it. You don't have to think about your old CDs collecting dust, even thought your CD player doesn't work anymore, and you listen to all your music on you iPhone anyway. You aren't hitting your shins at night on the stupid coffee table that hate but are don't know what to do with it. Your mental life will become simpler - and when it becomes simpler you will have emotional space to deal with all the negative thoughts that pop up in your life. Give away the stuff that reminds you of the bad things, your exs, the arguments you had with your spouse, your family, the ugly sweater you will never wear, the toy that your brother broke. Just give it away. Stop carrying all that baggage. Stop carrying this stuff around and reminding yourself of it. Give it away. But on top of that you also have to get rid of all the emotional baggage you're carrying around. This is going to be the hardest thing that you do in your life... but it is imperative for simplifying your life that you do this. Write down all the things that hurt you in your life. From the time you were a baby to yesterday... or even today if something upset you. It can be something as simple as - 'that jerk cutting you off in traffic'... or it can be bigger things like your girlfriend cheating on you, or your dad abusing you. Whatever it is that's hurting you, or that hurt you in the past write it all down. Write all the details you remember about this incident. Write it down on a piece of physical paper. Let your emotions run out on paper - if you have to cry let your tears fall on the paper. Write out everything. Once you've done this - then name the event. Just call it whatever you want to call this event. Keep repeating this until you have written out everything that's holding you back in your life. Until you've written down everything that's contributing to the 'novel' in your head everyday. It might take you some time - when I first did this - it took me a full week. I had so much stuff. I cried every hour, my eyes became sore, and my nose became red. I had to do it - i powered through it and got it done. Now that you have all of this 'emotional garbage' written out, I want you to take it outside and light a fire. You can do this on your BBQ grill, or just in your fireplace. If you don't have either do it in a steel drum. But just light a fire. Then take each piece of paper and read the name of the incident. Put the piece of paper in the fire and as you're doing it say out loud 'Thank you [incident name] for everything you've taught me. I now release you to the universe". Keep doing this until you've done this for every single one of them. Keep repeating until you've released every incident to the universe. Now you've got a clean slate. Now you've got a simpler life. Now you can go out and stop thinking about the emotional garbage in your heart. You can now create new memories, wonderful memories, memories of love, friendship and kindness. 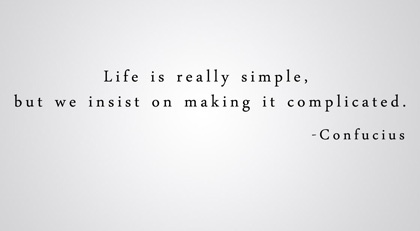 You will make your life simpler. Now you can go out and stop thinking about the mental garbage in your mind. You can now think about how to change the world, design your life, and create value for your friends, customers, clients, and organization. You will make your life simpler. Now you can go out and stop thinking about all the physical garbage in your life. You can now create new things in your life that nourish your heart, nourish your mind and allow you to live the life you've always wanted. You will make your life simpler. When you first set out to do this - your mind will blow a fuse. All the signals in your head will be firing... telling you to stop. But I implore you to push through and do it. Once you've gone through this - you will want to do this every month or so yourself. Because you will find the peace of heart, mind and soul in your life. You will realize the peace doing this brings. You will discover the secret of how you can make your life simpler. So think about that 1 thing that's been keeping you weighed down - and commit to.